Rosalyn “The Robe Lady” Anderson-Gordon, is a 52-year-old native of Savannah, Ga. She is a designer specializing in custom clergy robes, African attire, ceremonial garments, handkerchiefs and towels. Gordon began sewing in her home over twenty five years ago. 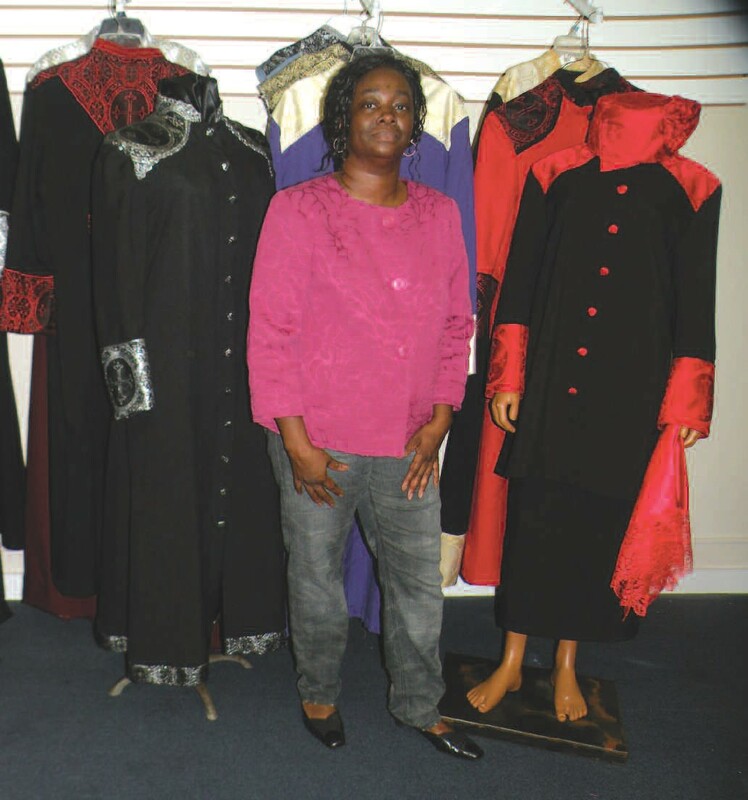 As she became more experienced with her talent, she began to specialize in wedding attire, costumes, and alterations for military and police uniforms. “My customers gave me the name “The Robe Lady” because they didn’t know my name but they knew me by my robes,” Gordon said. Gordon has moved The Robe Lady Designs from her home to a new location, 2409 B. Waters Ave. She opened on April 4, 2012. “In all, it took me two months to get up and running,” Gordon said. “My pastor, Ricky Whitney of Beautiful Zion Church was a true inspiration and helped to get me into this building. He did all the renovations for me,” Gordon said. The Robe Lady is now housed in a cozy 2000 ft. building which includes the boutique showroom, cutting room, and workroom. “The Robe Lady” is currently a one person business operated solely by Gordon. “It is a small place, but this is what God placed on my heart and this is all I need right now. I plan to upgrade in about a year to something bigger,” Gordon said. Gordon has always had a passion for designing and producing custom made items for customers to give them a distinct tailored look. “I have a deep passion for designing; I am able to visualize fabric into a garment; customized for the individual with one look at the person and some small talk to get an idea of what they would like,” Gordon said. “My fabric is unique; I have designer fabric and clergy fabric that is unusual because of the detailed design in the fabric, I am the only designer in this area that I know of with ecclesiastical brocades,” Gordon said. Aside from sewing, Gordon also serves the local community through an outreach ministry in collaboration with her church Beautiful Zion of Savannah, Ga.
“I have a feeding ministry along with my church Beautiful Zion, it’s called Lending a Helping Hand, we provide hot food, bottled water, clothing items, and toiletries to the disadvantaged,” Gordon said. The outreach ministry serves about 150-200 people once a month at different shelters across the city, in the woods and to homeless people under bridges. “We are looking to expand and serve more frequent than once a month but serving once a month helps, it’s a great feeling being able to put a smile on someone’s face,” Gordon said. The Robe Lady Designs are opened on Monday through Friday from 9:30 a.m. to 5:30 p.m. and on Saturdays by appointment only. For more info on the Robe Lady Designs call (912) 233-7471 or email Rosalyn “The Robe Lady” Anderson-Gordon at RobeLady@yahoo.com.